Ankit Kumar Saini from Noida, B.E. - B.Tech Graduate. Ankit Kumar Saini is Mechanical Engineer and currently have no work experience. C C++ MICROSOFT VISUAL BAS.. MICROSOFT OFFICE EXCEL WINDOWS XP WINDOWS 7 WINDOWS 8 C C++ MICROSOFT OFFICE WO.. WINDOWS 8 AUTO CAD MICRO SOFT WORD..ROB.. are one of expert skill area's of Ankit Kumar Saini . 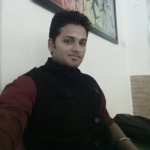 Ankit Kumar Saini is working in Production/Manufacturing/Maintenance industry.